The Sugar Merchant by James Hutson-Wiley thrusts the reader into the historical period towards the last part of the eleventh century, an era witnessing an economic revolution. Thomas Woodward loses his family at the age of eight to one of the raids conducted by Tostig, an outlawed son of Godwin and brother of King Harold. He loses his family to a raid, but is rescued from hunger and hopelessness by a monk and brought to the abbey of Eynsham, where he spend the next twelve years of his life training to be a scholar, merchant and spy, with a mission to develop commerce in the Muslim world and act as a spy for the Holy See. Thomas’s life is set for adventure as he travels through different lands, and knows love and loss and heartbreak. With complex challenges besetting him and his personal demons, can he accomplish the mission successfully? James Hutson-Wiley captures the soul and spirit of the era in a brilliant way in the narrative, allowing readers to relive the religious, cultural, and political tensions of the time. He weaves themes of espionage, religious intrigue, and the personal struggles of a man into a story that takes readers across different distinct cultures. The historical elements of the setting are skillfully knitted into the narrative and the author uses them to enrich the conflict. I was fascinated by the compelling social and cultural commentaries that paint a vivid image of the time. The use of the epistolary style enhances the plot points and the conflict while helping to deepen character development. 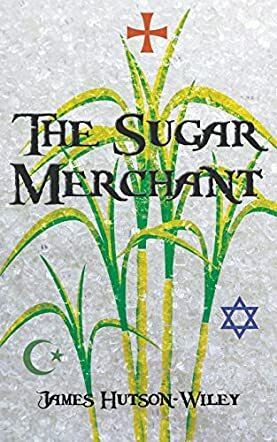 The Sugar Merchant is a great achievement and a page-turner for fans of historical novels; a story with powerful themes, compelling characters, and a gripping plot. The Sugar Merchant, a historical, fiction, religious, romance, written by James Hutson-Wiley. At age seven, Thomas Woodward learned hard lessons from life, by losing everything, especially his entire family to barbarians. After running for his life, Thomas eventually gets rescued by a monk from a remote abbey in England. While living there he learned how to pray, to read and write manuscripts, to multiply and divide the money, and he learned how to defend himself against any attackers without mortally wounding them. Because of his strong love for God, Thomas used his training to sell merchandise to earn money for missions to help out the abbey. Since he had set out to glorify God through making money, Thomas became wealthy and famous. Will all of this greatness separate him from Jesus, or will God stay his main focus? The Sugar Merchant, a fictional, historical, drama, written by James Hutson-Wiley. Thomas Woodward had tragically lost everything including his entire family at age seven. While running for his life a giant monk rescued him from certain death while staying at an abbey, he learned many valuable lessons, eventually helping him make large sums of money. With all his fame and fortune, will Thomas keep his trust in Jesus, or will he get caught up in worldly desires? This has been one of the greatest books that I have ever read. I love how the background is set in the eleventh century, and how historically correct it is. With the few graphic scenes, I would recommend this book to a mature audience. The Sugar Merchant by James Hutson-Wiley opens the doors to a world of espionage in the Catholic church, the mysteries of merchants, and the fight for the Holy City, Jerusalem. With a wealth of experience in the world of international trade and travel, the author allows us to experience life through a religious man who sought to dedicate his life in service to the Lord. Thomas Woodward wondered why he was treated and trained differently in the monastery at Eynsham. He was being groomed for a great cause that few knew about. Leaving under the pretense that he was going to Jerusalem on a pilgrimage, little did he know his destiny would end at that city. As he prepares to honor a vow, he pens this memoir to his son in hopes he will understand the struggles he faced serving two masters and the circumstances that send him there. James Hutson-Wiley has captured the persona of the underworld of monks and the larger role they played throughout history in their unassuming position. The Sugar Merchant is a powerful glimpse of the war in the Middle East during the late 1100s. The author’s insight into the trade industry and the “enjoyable” process of negotiation is educational to those who are from countries that do not practice this art of purchasing. Along with the importance of understanding the customs of other nationalities, the correct way of giving respect is an invaluable insight if you plan to travel. I thoroughly enjoyed this novel and would recommend it to others who are fans of historical fiction. The Sugar Merchant by James Hutson-Wiley is a historical novel set in the 11th century. Thomas has lost his entire family in a raid and, after he is found wandering, starving for days, a monk takes him to the Abbey at Eynsham. Thomas is trained to be three things – a scholar, a spy, and a merchant. He is given a mission; he must go to the Muslim lands and develop commerce as well as convey important information to the Holy See. His travels take him on a long and dangerous journey through a world that is pure chaos. Can he fulfill his destiny amidst the commercial revolution, a time of huge change, or will conflict rule his life forever? The Sugar Merchant by James Hutson-Wiley is a deep novel covering many subjects that are relevant to today’s world, including multiculturalism, innovations in technology and commerce, and immigration. Reading this novel, it's very easy to draw parallels between this time period and the current times we live in – there really isn’t so much difference! It is a well-written novel, brought fully alive by the descriptive style of writing that draws the reader skillfully into the story. It is well paced with plenty of action and with characters that are incredibly well developed to the extent that you feel as if you know them personally. Reading it was like being pulled straight back to the 11th century, seeing it in vivid color and experiencing life as it was then. I really enjoyed this book and am looking forward to the sequel. The Sugar Merchant is an intriguing work of historical fiction written by author James Hutson-Wiley. Set in parts of Europe and North Africa during the eleventh century, this clever tale explores the nature of cross-cultural relationships and the building of an economy between Christians of the West, Jewish merchants and the Muslim merchants of the East. Our central character is Thomas Woodward, a man first adopted by monks, who rises in notoriety to become a traveler and a merchant who seeks the finest wares that the world has to offer. But beneath that Thomas has another occupation, one more dangerous and intriguing than the first. As Thomas embarks on his exciting voyages to develop commerce within Muslim communities and send important information overseas, what was first a humble historical life story becomes an adventurous spy novel with many twists and turns. I found Thomas to be an exciting and capable leading man, though readers are distanced from him emotionally in a very John Le Carré style of narrative. The culture clash is both realistic and sensitive in its portrayal, and it’s plain to see that author James Hutson-Wiley has done extensive research into many cultures and countries of the time. Medieval Egypt was a particular highlight for me, descriptively speaking, as we so often only see its ancient side. Here, it is a vivid, lively hubbub of business and danger that was superbly brought to life. Overall, I’d certainly recommend The Sugar Merchant to fans of medieval fiction which is well researched and skillfully told.